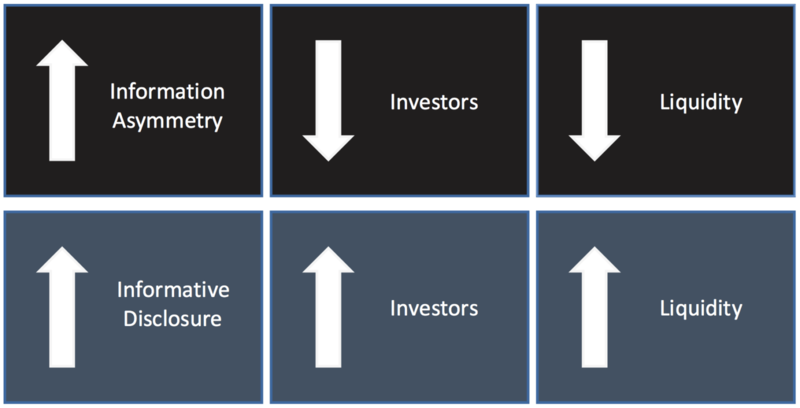 The higher the risk (perceived or real), the higher the premium and cost of capital companies have to put up with, and generally, the more challenging it becomes to attract investment. In addition, the stage of business also plays a key role in the risk calculus. Typically, the earlier the stage, the riskier the investment proposition. It would stand to reason then, that early stage companies raising capital ought to do what they can to mitigate risk to prospective investors. If either regulated or unregulated markets are more ideal for companies to manage risk, and therefore, to raise capital. A basic difference between traditional, regulated securities markets and the unregulated crypto market is that the regulated markets prioritize policies to enhance investor protection which include strict disclosure requirements for participating firms while unregulated markets leave it to each firm to determine the extent of its own disclosures. Regulated markets encourage policies to enhance and encourage corporate governance. Unregulated markets are often mute on the matter. Listing firms are required to comply with strict and costly registration procedures prescribed by securities regulators Being unregulated, available information is often limited, the financial, non-financial and technical information that firms voluntarily disclose is questionable. There are hard and soft requirements that vary with listing requirements of the exchange involved and overall jurisdiction (e.g., audited financials and balance sheet items) In many cases the project for which tokens are offered to the public are just outlined in a white paper and have no tangible reality. Regulated Market Effect: A byproduct of heightened disclosure and transparency is increased liquidity and mitigation against volatility and crash risk. The Libertarian-minded tend to criticize regulated markets. They complain policies requiring certain levels of corporate governance and disclosures are cost prohibitive for small firms to comply with. They are too onerous. They should not be regulated. Counter Example: Critics of regulated markets point to the emergence of the crypto markets as proof positive that investors and issuers alike are comfortable with less regulation, less disclosure and that issuer and market liquidity need not be sacrificed to those ends. Coindesk reports that as of May 31, 2018, approximately $13.89 billion has been raised by some 734 companies through Initial Coin Offerings (ICOs). Year-over-year, the growth in the ICO markets has been remarkable. However, while emergence of the ICO markets has validated that here is tremendous demand amongst issuers and investors to participate, it has not provided comfort that unregulated markets are in any less immune to volatility and crash risk. The 2018 ICO market has nothing but volatile, and arguably, susceptible to crash risk. Amidst the dismal performance of leading cryptocurrencies, ICO participation has fallen off as well. May ICO capital raised was down 55% from the 2018 peak of $2.3 billion. To be fair, on a year-over-year basis, May was up 357%. So, it remains to be seen exactly what impact self-imposed disclosure in the crypto markets is playing in the recent volatility. In a recent paper, “Initial Coin Offerings: Early Evidence on the Role of Disclosure in the Unregulated Crypto Market,” Bourveau et. al. 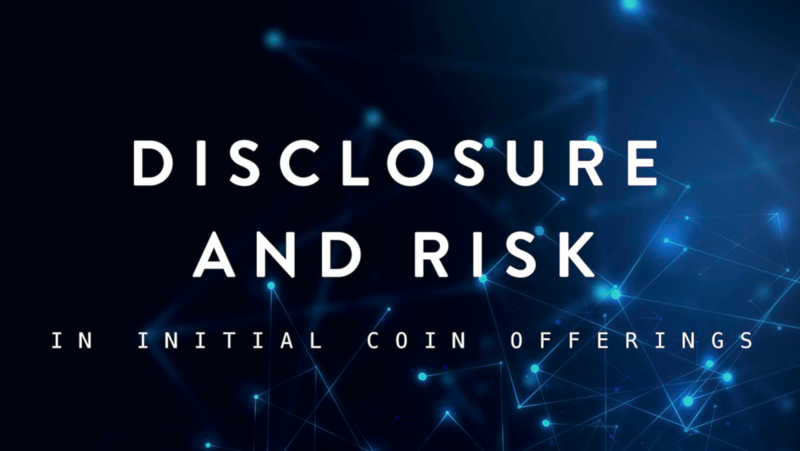 set out to study whether any disclosure norms and best practices have emerged, or evolved in the crypto market, and to the extent that they have, whether these disclosure practices provide capital market benefits. Completed ICOs tend to (i) disclose their sourcecode, (ii) disclose more informative whitepapers, (iii) have stronger information environments (iv) provide disclosure about lock-up periods for founders’ tokens, and (v) tend to be rated higher by crypto market information intermediaries. An aggregate measure of ICO quality – i.e., a rating from two external rating providers, is positively associated with the likelihood of completing and ICO. The information environment, as captured by social media activity, is positively associated with the amount of funds raised. Stronger information environments are associated with lower illiquidity and volatility. Evidence consistent with some ICO entities strategically timing their capital raise during ‘hot’ markets and engaging in ‘pump and dump’ schemes that harm investors. Sourcecode / technical disclosures are positively related to future crash risk. 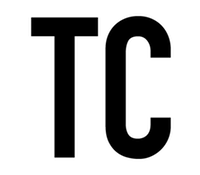 An interpretation of these results could be that sourcecode disclosures represent proprietary disclosures that subsequently erode the competitive advantage of the virtual organizations and allow other entities to mimic or build off their technologies. Extreme negative returns are associated with lower readability of whitepapers disclosed by virtual organizations, but positively associated whitepaper length. Higher quality ICOs are less likely to crash. In addition to these findings, the authors point to prior studies in traditional capital markets that generally show disclosure reduces the cost of capital, and that disclosure regulation and enforcement are beneficial for well-functioning capital markets and point to evidence that “even in the crypto market, disclosure is important and can help to identify firms with higher liquidity, lower volatility, and lower crash risk. If adopting a policy of information disclosure so clearly leads to increased investors / access to capital and liquidity, then why don’t all firms prioritize this behavior? In unregulated markets such as the crypto market, disclosure policies are not mandated but rather, evolve as best practices, shaped by market forces. Firms that adopt proactive disclosure practices are more likely to benefit from increase investor support, access to capital and a lower cost of capital and better liquidity. This list doesn’t include disclosures that are expected of firms operating in regulated markets, such as: access to due diligence, a detailed pro forma financial model, prepared financial statements, a thorough disclosure document with non-boilerplate risk factors, access to the management team, officer and director questionnaires / disclosures, amongst other things. Management teams that provide high-quality, integrated reporting and disclosures across all channels that tell a clear story help investors and enhance capital-raising potential. The quality of a company’s reporting and disclosures can have a direct and indirect effect on investment decisions. An understanding of a company’s long-term strategy is critical to investors. Investors place extremely high importance on information concerning key risks to the business model. Investors want to know about operational KPIs as much as financial KPIs. Investors value detailed presentations, financial statements and annual reports for comprehensiveness. The authors analyze a comprehensive sample of 776 firms that have tried to access the crypto markets over the April 2014 to February 2018 period, out of which 659 successfully completed an ICO.